Junghans Uhren GmbH is a German watch and clock manufacturer. Junghans had the largest watch and clock factory with over 3000 employees in the year 1903. The company is located in Schramberg, Baden-Württemberg. On 15 April 1861 Erhard Junghans created the company “Junghans und Tobler” together with his brother-in-law Jakob Zeller-Tobler in Schramberg. 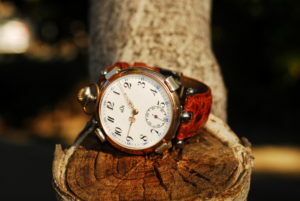 The company began to produce wristwatches in 1927. Beginning in the 1950s, the Bauhaus designer Max Bill created clocks and watches for Junghans and the relationship lasted many years. A remarkable example of his work is a wall clock he designed in 1956–57 that is in the collection of The Museum of Modern Art. In 1962 Bill also created mechanical wristwatches for Junghans. In the late 1980s, Junghans introduced the first radio-controlled table clock on the world market. In 1990 the first radio-controlled wristwatch, called the MEGA 1, followed. In 1995 Junghans presented a solar powered watch with ceramic housing. Together with the Japanese clock maker Seiko, Junghans developed a globally oriented wristwatch that automatically sets the local time in respective time zones.